I don’t know if I could call this street food, because I’ve only tasted these in Tamilnadu (South India) beaches. It is quite an experience, munching on this hot and spicy sundal while caressed by the salty ocean breeze. 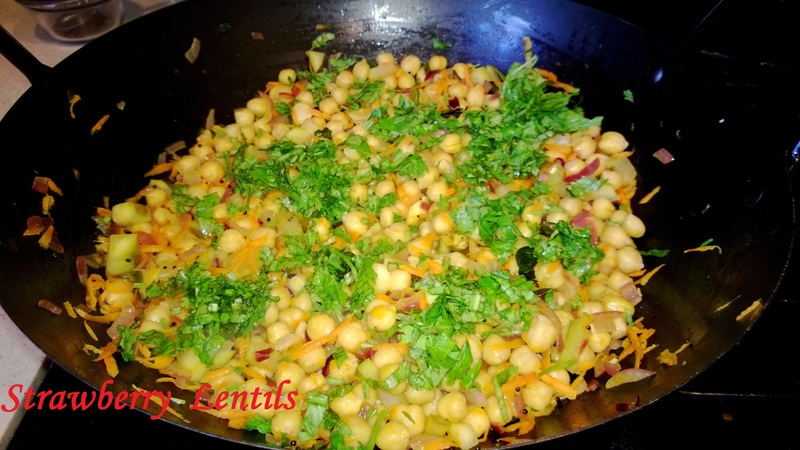 It is called “Thengaa (coconut) Maangaa (green mango) Pattaani (peas) Sundal”. 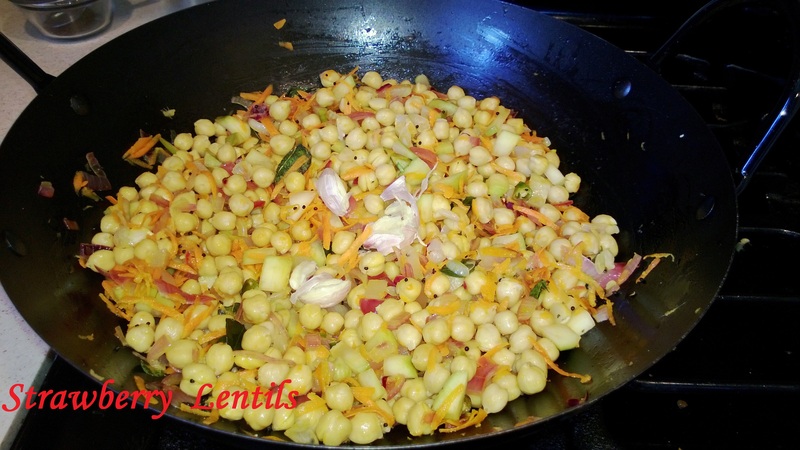 I have never tasted coconut in this sundal, so I don’t add coconut in my recipe. 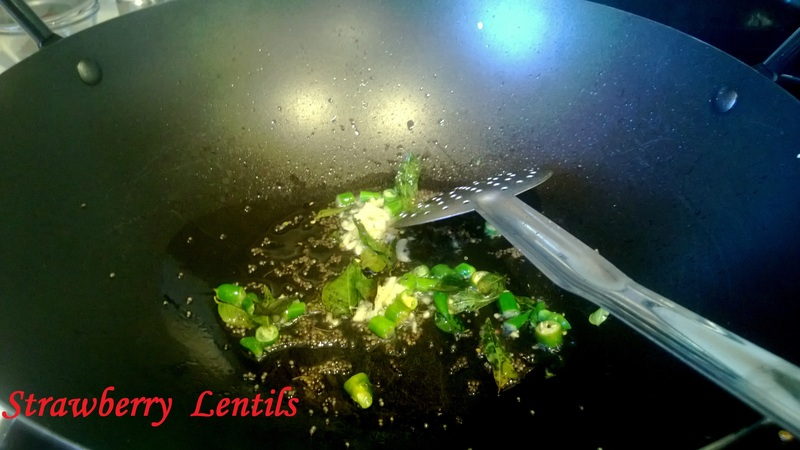 In a pan/wok, heat 3 tsp of oil and splutter a tsp of mustard seeds. 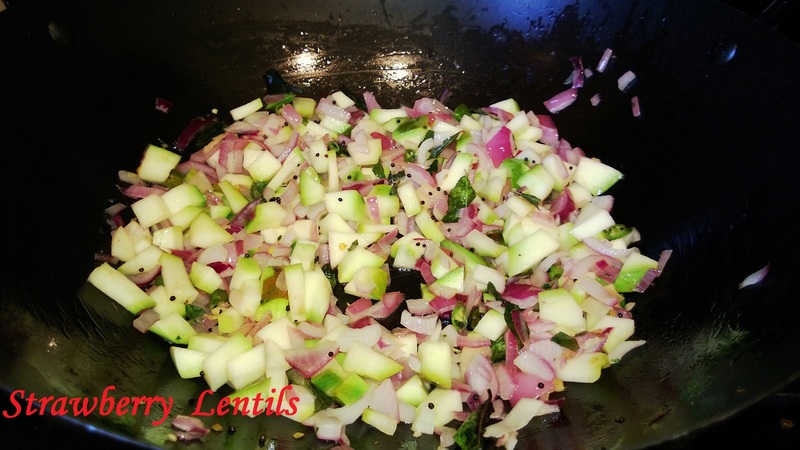 Then saute the chopped green chillies, grated ginger and curry leaves. 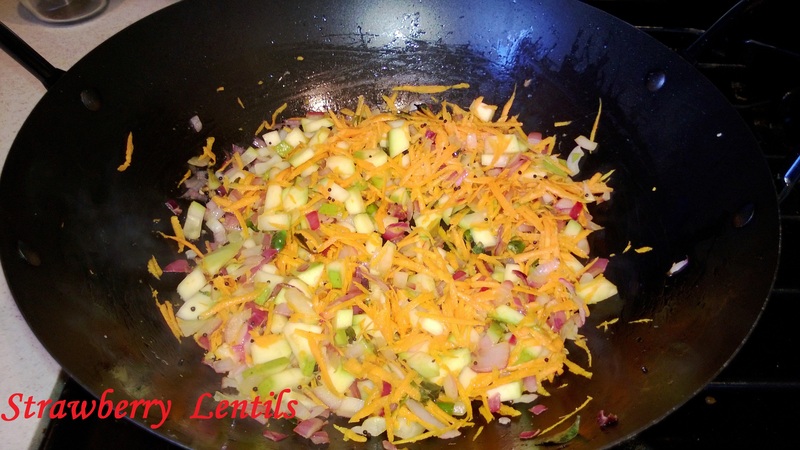 Then add the onions and green mango together and saute, just enough to take the edge off. The onions and mango shouldn’t become too soft. Saute the grated carrot. Again , make sure they don’t soften too much. Add salt to taste. Finally sprinkle the chopped cilantro and turn the heat off. Add more salt if needed. Also if you want to make it more spicy , you can add crushed red peppers. Cover with lid and leave the sundal in the same wok for at least 10 minutes (with heat turned off). And you have to serve this sundal in paper cone to complete the beach experience. 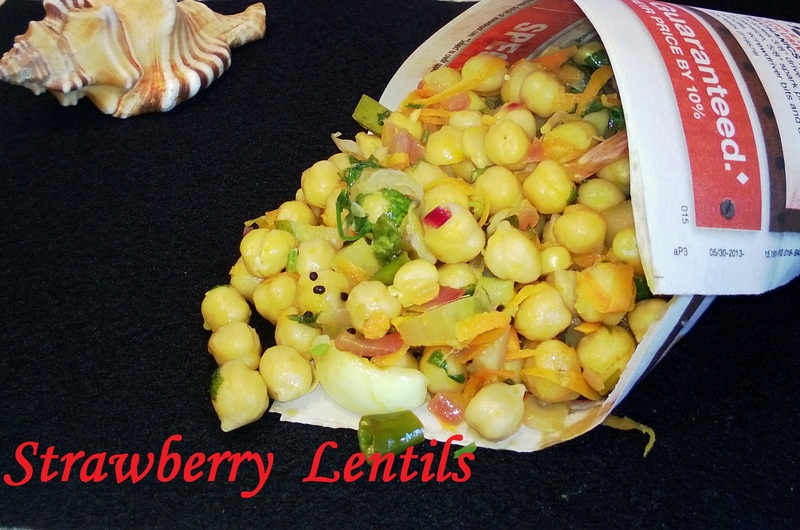 Posted on June 23, 2013 by strawberrylentils	• This entry was posted in Apetizers, Indian, Sides, Snacks, Vegetarian and tagged beach sundal, chick peas salad, pattani sundal, sundal, thenga manga pattani sundal. Bookmark the permalink. Hi, found your site through veganrecipesonline. Girl! 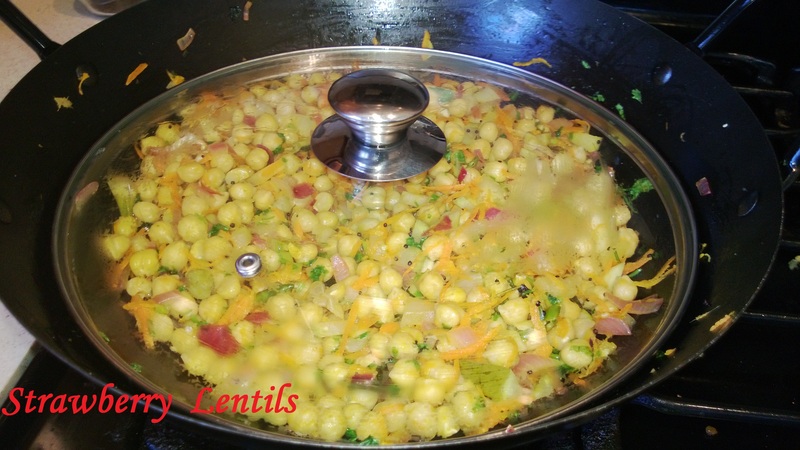 you have immense patience to give us fodies a step by step pictorial of the recipes! Great effort. Thank you Namrata ! I am a visual person, I learned to cook by wathcing my grandma, mom and aunts cook. Next time I will try the coconut for this recipe. Usually I add coconut for the navarathri sundal. Btw, what is your blog’s name ? myfoodtapestry.wordpress.com is my site. Its not just a food site but I write on varied topics as well. Do check it out and let me know what you think. Thanks. 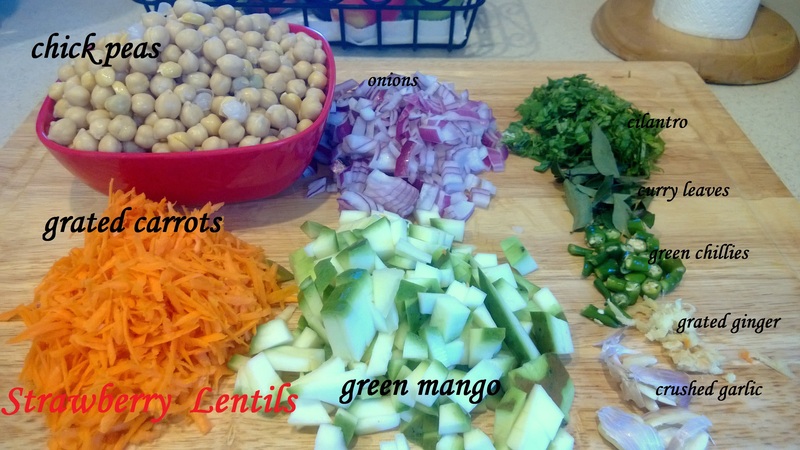 Just came across your blog and this recipe has brought back warm memories! Thank you! !